Hello there! I’m so happy its Friday; it’s been one of those weeks that drags on. 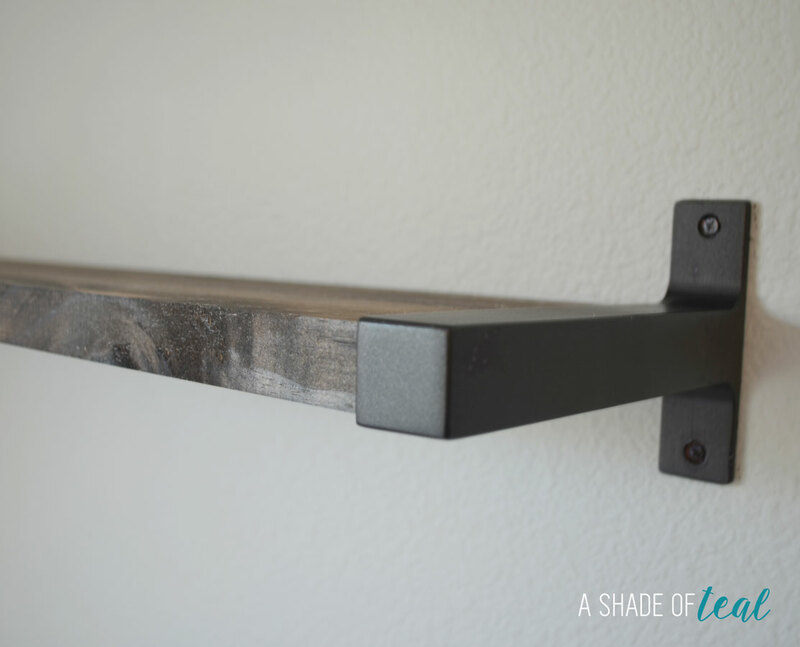 Today I’m sharing how I made my DIY rustic bookshelves with IKEA brackets. I know so many other bloggers have made these DIY shelves already but mine are a little different. First off I purchased the Ekby brackets from IKEA. I spray painted them in bronze so they would better match the rustic look I was going for; Rust-Oleum in Oil Rubbed Bronze is my favorite to use. Now for the point of difference…These brackets fit a piece of wood that is 1″ thick. 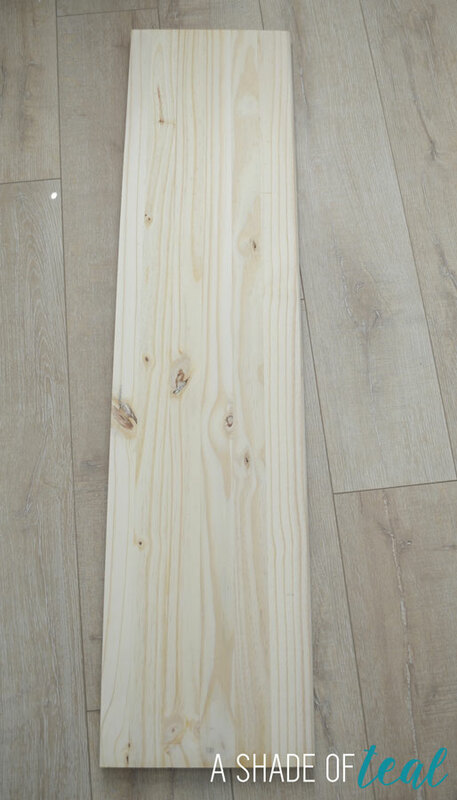 So I went to the hardware store and bought 1″ wood thinking everything is great. Well I get home and place the bracket over the wood and there’s a gap. Of course me being OCD and can’t handle the look of this, well I freaked out! It looked soo sloppy and not professional. I then went back to the hardware store thinking I bought the wrong size wood but then I was reminded that when you buy lumber it doesn’t match the dimensions they call out. So if you expect to buy 1″ thick it will most likely always be 3/4″. I really don’t understand why the industry does this. I wish they would call it 3/4″ or just increase the size to 1″ but who am I to change what has been happening for years! So, I started researching what other bloggers did for this project on Pinterest. I was very disappointed to see they all accepted the 3/4″ thick wood. Here are some pictures of others shelves, I cropped their pictures so not to name names! This was not gonna work for me so I went back to the hardware store with my bracket in hand to find something, anything that would work. Well I finally did! I was so excited when I stumbled upon the stair threads like these. They were too wide and long for the shelves but the thickness was exactly 1″ wide. I bought 2 and took them home knowing I would make them work. As you can see these have a bull-nose on 1 side which could be a unique feature for a shelf but I liked the idea of clean lines. So my plan was to rip the stair thread down to the width of the bracket, I think it was 7 1/2″ wide. I also cut off the bull-nose piece. 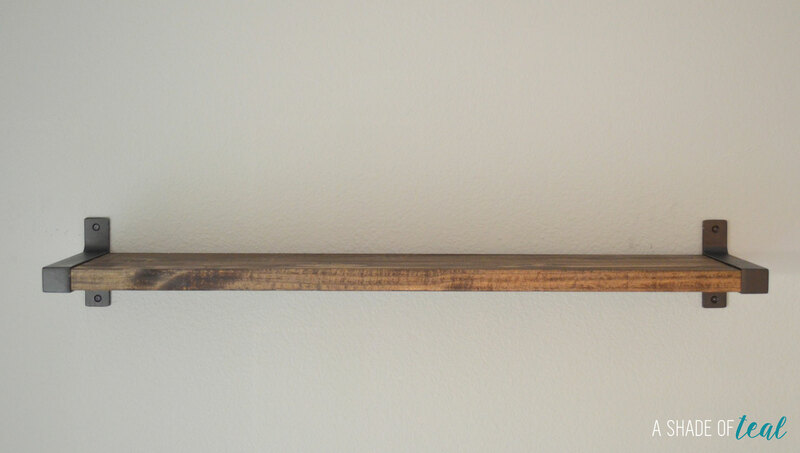 I then cut the wood to the length of the shelf I wanted. I made mine about 35″ long. 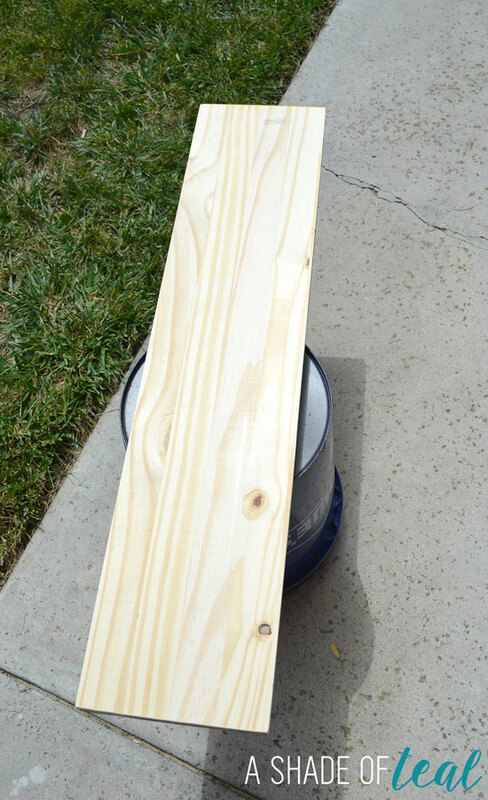 Now that the lumber was ready I lightly sanded it and brought it outside for staining. I used Dark Walnut by Minawax. Once dry I installed it by following IKEA’s instructions for the brackets. You can see the wood fits the brackets perfectly! It looks so much better don’t you think? Now I have a custom Rustic bookshelf that looks professional and high end! I love them soo much! 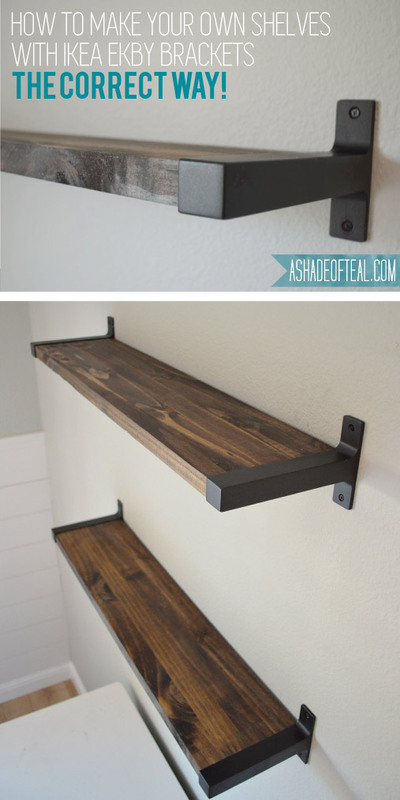 I already have a couple more of these and plan to add these shelves to my bathroom. I hope you learned from my mistake and find lumber that fits the brackets! Now for some styled pictures of the shelves in action! Check out more pics from my Office along with the entire Office Reveal. Well done! I am so impressed by your handy skills. And I love the stain color you chose! I literally just stumbled into your blog (hi!) and then while wandering around found this post – the whole ‘wood-too-small-for-the-brackets’ thing is exactly why I hadn’t done this project even though I’ve been wanting to. 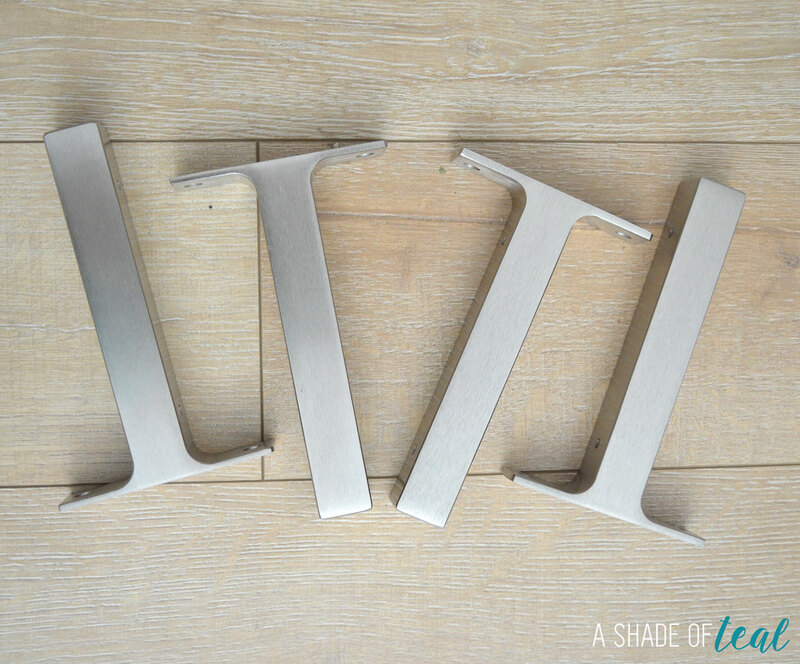 I was planning for an IKEA run (there isn’t one close to me, so its an all-day planned affair) online when I found these and had the same idea a few months ago to paint the brackets bronze and put real wood in it, but every post I found when I googled it to see the brackets in ‘real life’ had that little gap, so I didn’t pick them up. Next trip, those suckers are MINE! Oh I’m soo happy you found me! 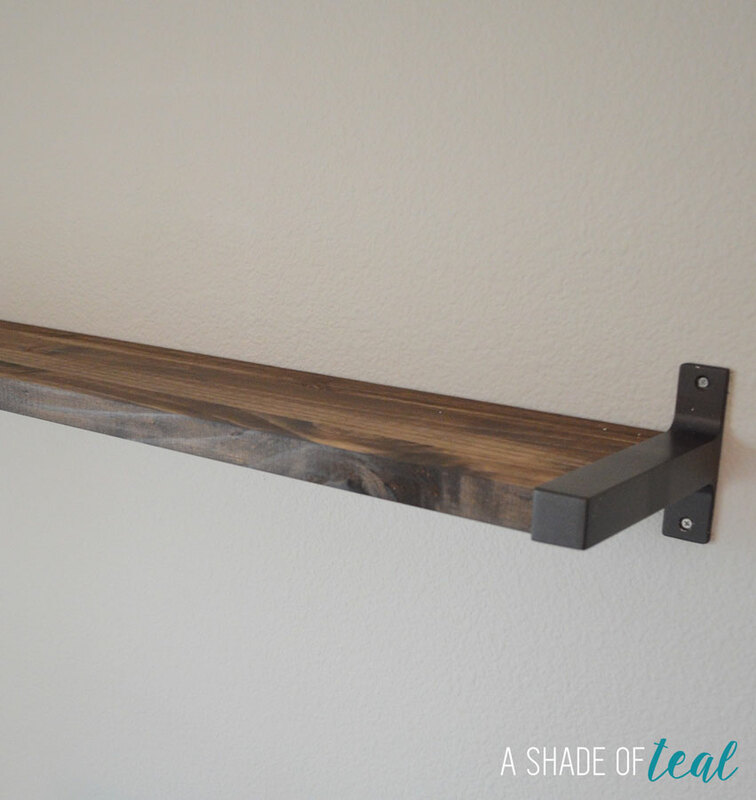 These shelves take a couple extra steps with the wood but its so worth it! Thanks Jae! I’m so glad you found my blog! These shelves are awesome ! I want to put them in my nursery. Can you let me know what stain & color you used on them please ? Thanks Jessica! I used “Dark Walnut” by Minawax. How many coats of stain did you use? just wondering where you purchased your stair treads? Hi Noelle, I bought mine at Lowes. 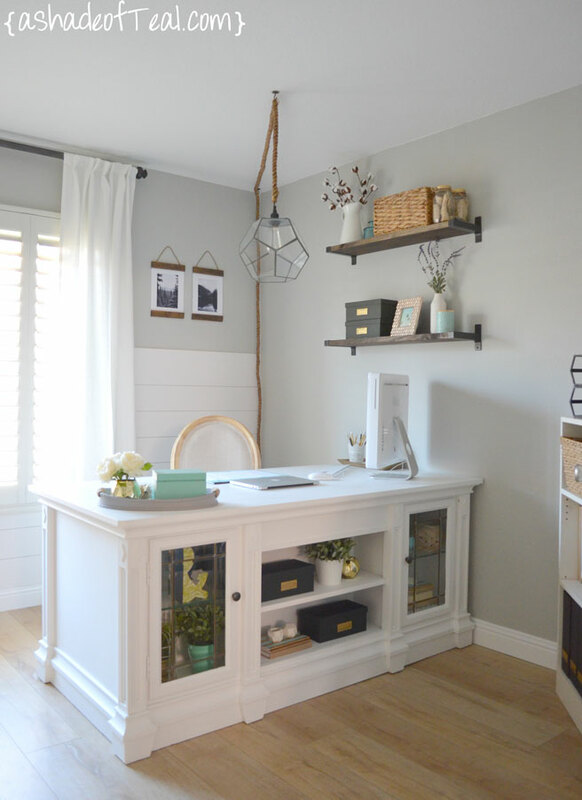 Love the shelves and also the white desk in the photo, was that a DIY project? Thanks Brenda! And yes, the desk was a old desk I redid. Is that on your blog anywhere, the making of that desk. I, too, gasped when I saw it!!! 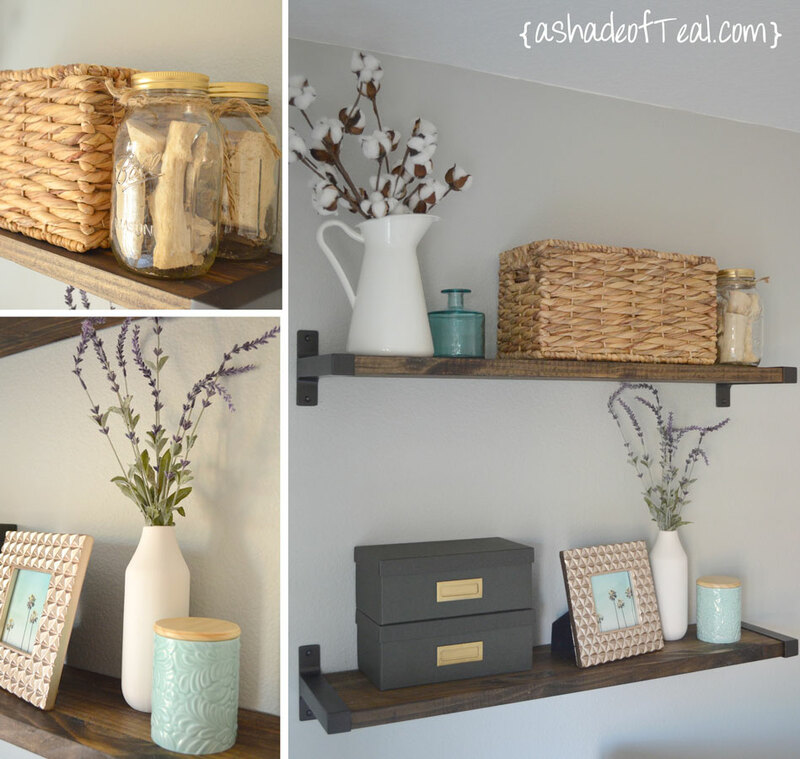 Love the little pale green jar on the shelves, which came out SO NICE. I don’t like all the metal/iron look brackets that look sort of jagged, so these caught my eye! I would have hated that gap, too! ***WHAT WAS THE TOTAL COST OF YOUR PROJECT FOR THE TWO SHELVES?? Do you think if you’d kept the bullnose and turned the tread over, the bullnose would act as a slight “catch” for items about to slip off?? It was probably under $40 for both. Whether or not you keep the bullnose you will still need to cut the boards down, but nothing has fallen off my shelf’s. What type of stain did you use? I used Minawax Wood stain in Dark Walnut. 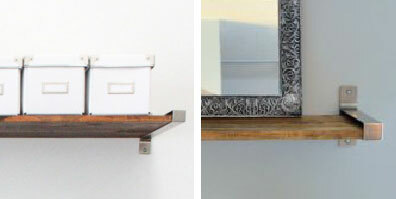 These look great- did you buy the 11″ ikea brackets or the 7 1/2″ ones? Thanks Kristen, I used the 7 1/2″ brackets. I didn’t know I needed these until just now. Thank you so much!!! What color stain did you choose? My new house will look so much better now!! Hi Jeff! 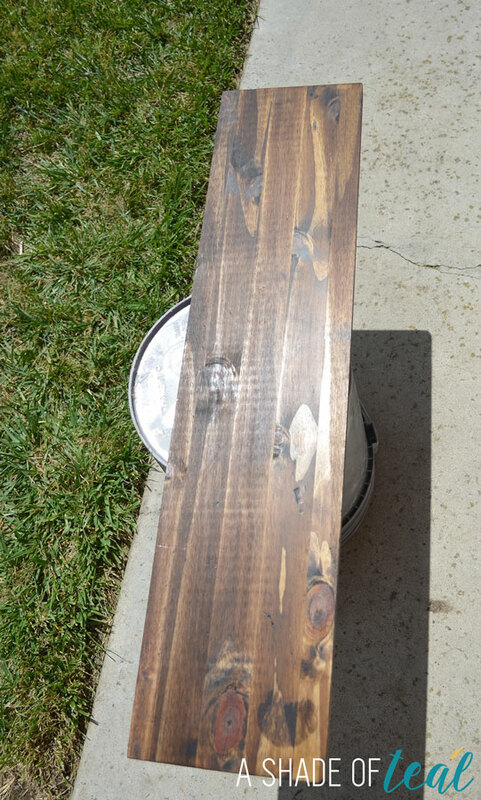 I used Minawax Wood stain in Dark Walnut and Rustoleum Metallic bronze spray paint. So glad you like them! Great solution. The gap would bother me too, glad you found something that works. Love that you painted the brackets too. Thank you, thank you, thank you!! I copied your look with the spray painted brackets and stained stair treads. I have gotten so many compliments on how great they look. I absolutely love them! Thanks Jenna! I’m so glad they worked out for you! I love your hack and ran into the same problem. So glad you shared your fix and plan to do this ASAP! Its amazing katy.. love your blog. can you help me please i have 1 cabinet which i need to stain to give rustic look, but i am new so don’t know how to stain, which brush you use and how did you do it ? Can you please explain to me katy. Hi Tanya- I actually don’t use a brush to stain. I use a clean cloth or rag. You can follow the directions on the can of stain, but pretty much apply it with the rag. Good luck! the 3/4 always bothered me too! I have a pair of ikea brackets that I got for $3 on the sale section but couldn’t find a way to use because of the wrong wood measurements! I love your solution! Thank you for sharing! this is EXACTLY what i needed for a simple, rustic AND chic change in my den. thank you SO much for posting this. I love this project! How many coats of the stain did you use? Did you put a clear coat on top of the stain after it was dry? If, so which type? your shelves are gorgeous and look like you spent serious money on them. thanks for solving the wood dimension riddle! i was avoiding brackets that have a fixed wood height for this reason. okay, total newbie question: will they cut the wood to size for me at the store & do they charge for that? now to obsess some more about what brackets to buy since i have more options, lol. Hi Linda! Thanks so much! I’m not sure if they’ll cut stair threads but it doesn’t hurt to ask! How far apart did you space the shelves? Thank you so much for the guidance for these shelves! It was so helpful and time saving. 🙂 We love them. Thanks Gail & Tony! I’m so glad it worked out for you. Stair treads! That is genius. 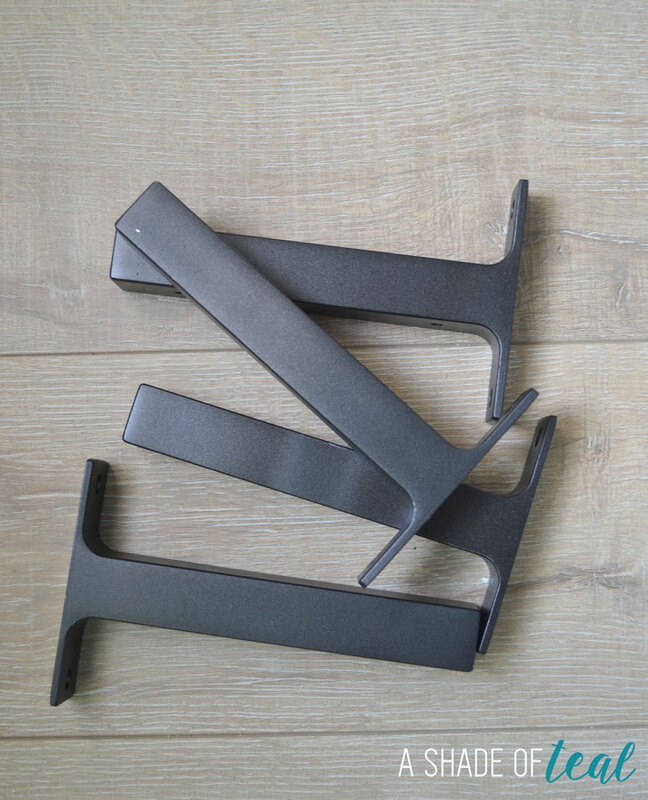 I found these brackets in Ikea last weekend, and passed on them because I thought my only choices were to buy Ikea’s particle board shelves, or live with the 1/4″ gap. 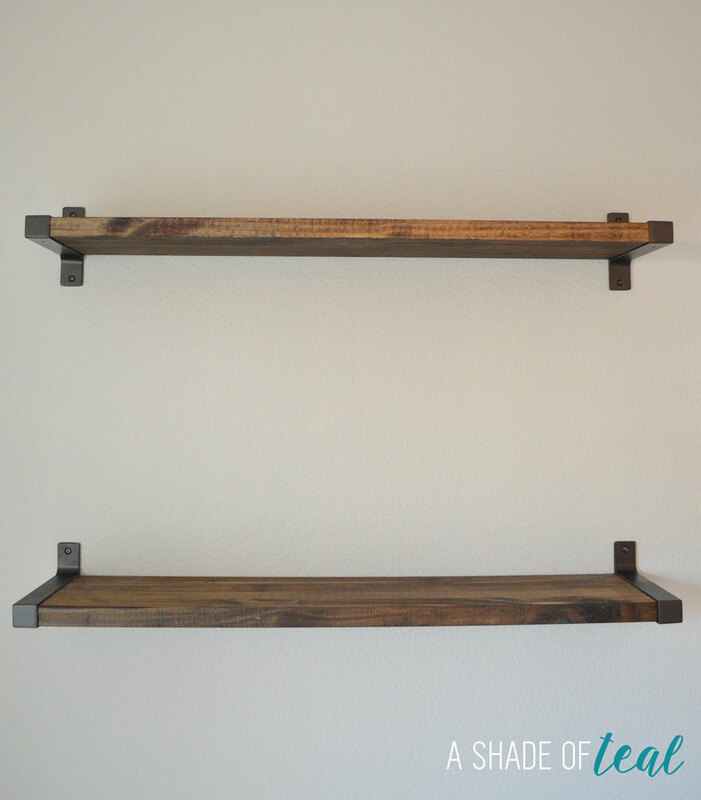 The only thing stopping me from doing this now is that I need these shallow shelves to store a ton of books, so I’ll have to source a bookend that looks halfway decent with the brackets. Thanks Barb, I’m so glad my tutorial helped! 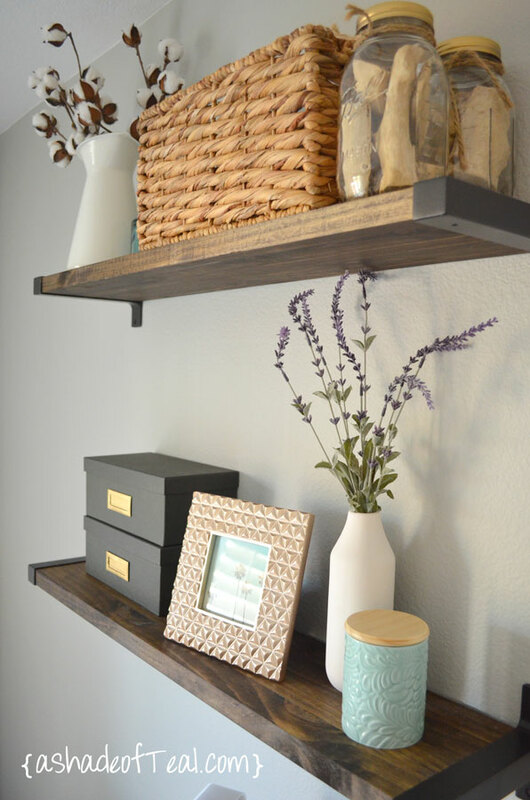 OMG….I LOVE YOUR SHELVES… I found you via Pinterest. We have a brick wall with pillars in our rumpus room that is screaming for industrial shelves but we couldn’t quite decide on how to achieve this. We have some fantastic old rustic timber and now with a trip to Ikea and to source your spray paint, we are good to go. THANKS SO MUCH…. Thanks Lou! So glad you like them! Being particular and making sure things are “just right” is not OCD. It may mean you are a perfectionist. It may mean you appreciate organization. It is not, and never will be, OCD. That being said, Your attention to detail really makes these shelves fantastic. I appreciate the extra effort that went into making them and for sharing how you accomplished it! My list for my trip to Lowe’s just keeps getting longer! Hi Katy, I just came across your tip on Pinterest. Do you think if I went to the hardware store and told them I want wood that is 1.25″ wide, that it would suffice? Yes if they have it! The problem I had was that I couldn’t find it anywhere. Good luck! Did you rip cut the stair tread with a table saw or just a circular saw? 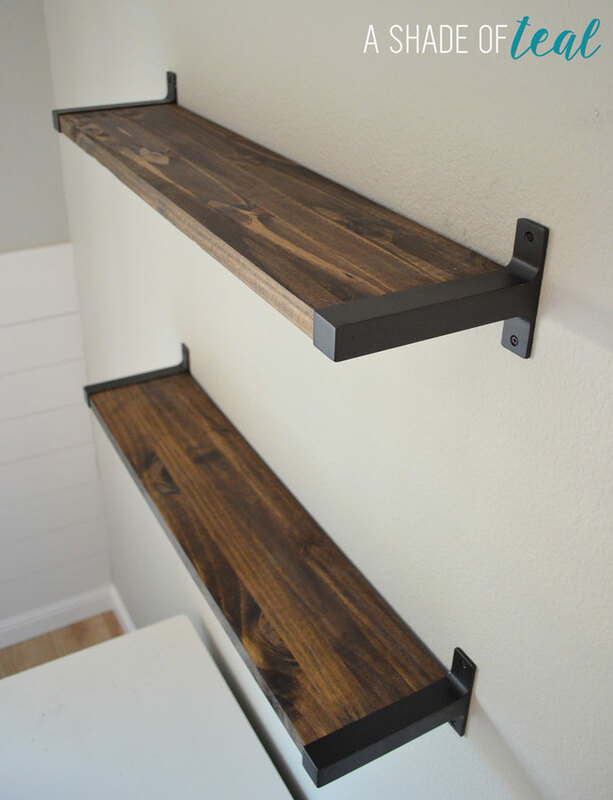 I saw this awhile ago and decided to buy the stair tread to make this happen but was bummed to find out that it didn’t fit the bracket…I reread your article and saw you cut off the bullnose part…may I ask how you did that so I can do that for mine? I used a table saw to cut the edge off. Hello, I LOVE YOUR WORK!!! WOULD YOU BE WILLING TO MAKE AND SELL A SET TO ME? I HAVE NO EXPERIENCE NOR TOOLS IN MILL WORK. I’m sorry, but I don’t do that. You can always purchase the wood from Lowe’s and have them cut it for you. Hey! Did you use pine or oak stair treads? I know you linked to pine on Amazon, but my local Lowes only had red oak which is heavier. I love, love LOVE your shelves and would like to put them over our bar area and add wineglass racks underneath. 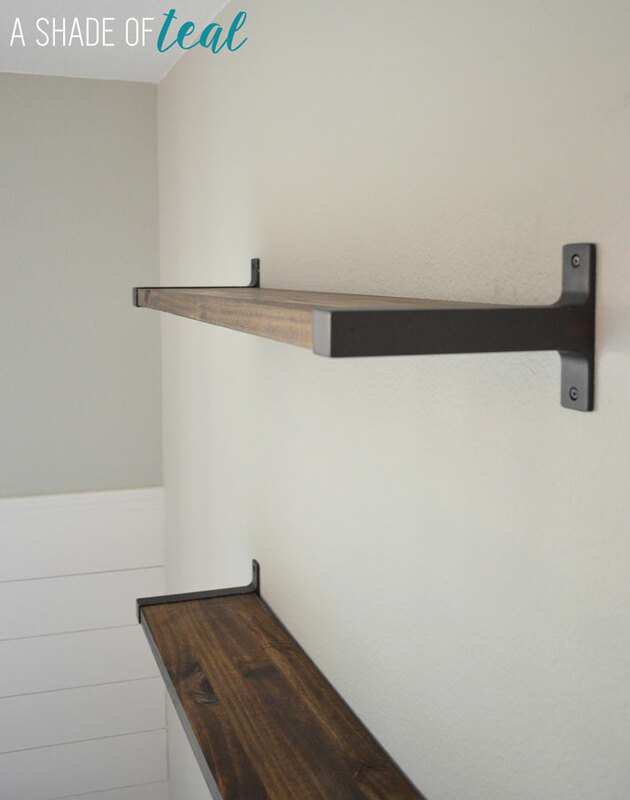 However, I want to buy the 11″ brackets with the 11 1/2″ stair tread in 42″ length, then cut off the extra 1/2″ bullnose and cut them in half width-wise, so, I’ll have two 21″ x 11″ shelves. My question is what type of mounting device/fasteners did you use, since they don’t come with the brackets? I want to make sure it’s strong enough and safe… wouldn’t want it to collapse and all the glasses (plus whatever I put on the shelves) come crashing down! I think I just used 1 1/2″-2″ screws. I did try to mount then into the studs but if I couldn’t I used wall anchors. I would definitely make sure you screw them to a stud since it sounds like you’ll have a lot of weight on them. Gonna try this tomorrow! I have all the raw material prepped to install 2shelves at my cousins place. I’m using the 11 inch ekby brackets, I think yours might be the 7 inch version. Thank you for the write up! Is it possible to see a picture of the finished project please? Did you use satin or mat stain? Stair treads! Genius! 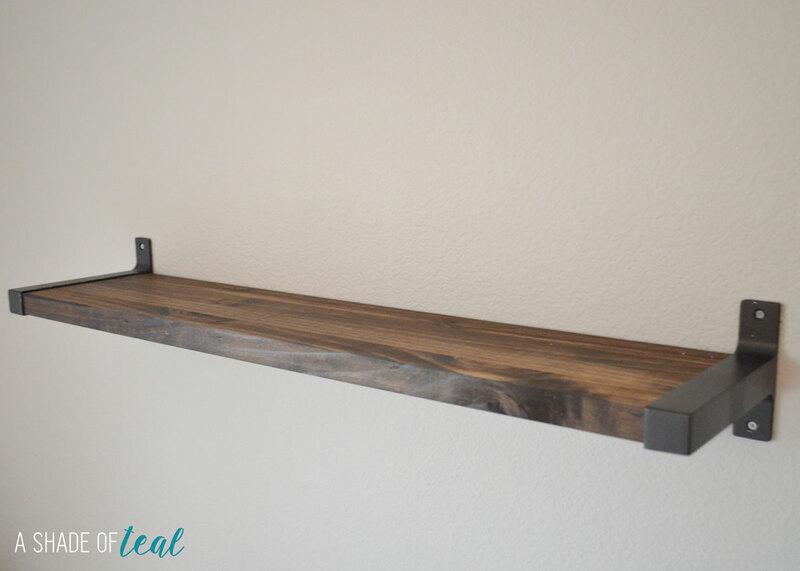 I currently have the white shelves with those brackets in my kitchen and have wanted to swap them out for wood, but that darn 3/4” just won’t do! Thanks for the tip! Your shelves look great!! Thank you so much for sharing this tip!! Total life saver! Did you cut the stair treads yourself? Home Depot and Lowe’s do not cut them because they are too thick and i dont know how else to get them cut…please help! Thanks!!! These are cool, i made these, very simple project, thanks for the heads up on the stair riser. What color paint did you use on your walls? Love the shelves too!! If the wood marked 1″ was actually 3/4″, was what you got as 1″ actually marked as something else? All I can find in stair treads are 1 1/16″ or 1 1/8″ or 3/4″.. I believe the thread said they were 1″ but honestly my store only had 1 option. But it can’t be more than 1″ wide to fit in the bracket, so maybe measure them at the store? I LOVE THESE SHELVES!!!!! 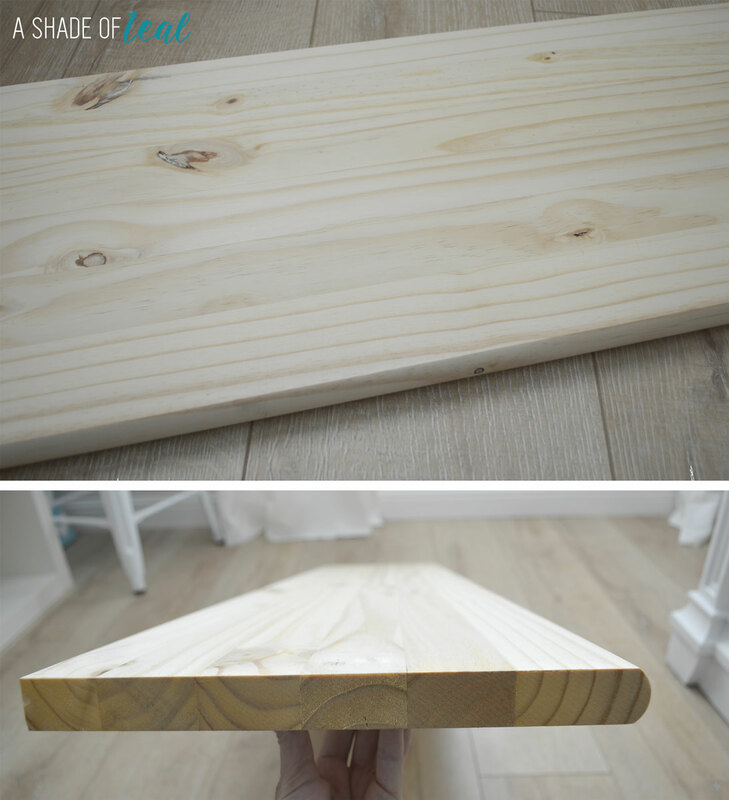 What are the exact measurements and stain you used please? Hi Susan! All that info is listed above. Thanks! Shelves look great. I made a version of these a few years ago for my kitchen. I was looking through Pinterest for a rustic looking shelf for my bedroom beside my vanity, and stumbled upon this. The steps are easy to follow and you set the link to buy them with ease. Thank you for this great idea. I Will be using the same stain for mine.